We offer a wide selection of wheels and tires. 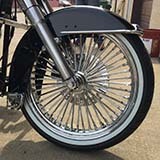 We can do up to a 21" front wheel conversion. Check out some of the wheels we offer below. If you don't see what you are looking for let us know. This is just a small snapshot of what we can get. The regular spoke wheels come in 40 or 60 spoke (60 spoke in photo). These wheels are a nice upgrade to the stock spoke wheels. They come in size 16", 19" and 21". They are available for softails, dynas and all touring models. This option is great for a slight change without completely changing the overall look of the bike. This fat spoke wheels give the bike a nice look. They come in 50 or 52 spokes and chrome or black. We can get them in 16", 19" or 21" for the front with matching in the back. These usually don't require a tube when installing the tire. They are availiable for all models. Different style of spokes are also available. The Manhattan wheel gives the motorcycle a nice face lift. Being a mag wheel this one does not require a tube when the tire is installed. The Manhattan wheel is available is polished or black and in 16", 18" and 21". Both front and rear matching are available. 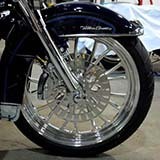 These wheels can fit all softail, dyna and touring models. The Kool Kat wheel gives the bike a unique look. This is a wheel that not everyone has. This mag wheel does not require a tube to be used when installing the tire. These wheels are available in polished and black and come in sizes 16", 18" and 21". Both front and rear matching are available. 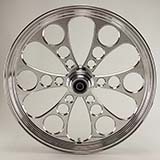 These wheels can fit on all softail, dyna and touring models. 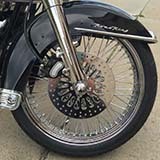 The second gen of the Harley Davidson Reinforcer wheel comes stock on most newer models. They are available in 19" and 21". The one pictured has been powder coated (click here for more info on that service). 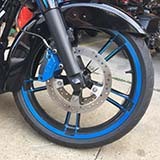 These wheels can make an older bike look like a newer one. Available for both front and rear matching. 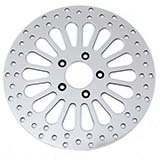 We also offer a wide selection of front and rear brake rotors to go with your custom wheels. Options include chrome or chrome and black and many different styles including Manhattan, Kool Kat, and many other after market styles.